Today I would like to share a couple of fun crafty makeovers that I recently completed for my bathrooms. 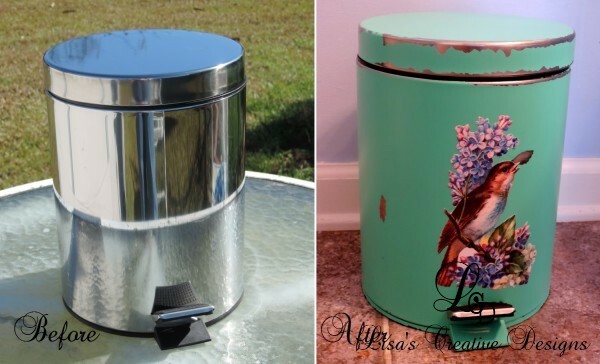 If you have been following my blog for a while you may remember the post about my Generic Trash Can Makeover for my master bathroom. It is no secret that I am a fan of cottage style and generic chrome just does not fit into my design scheme. For years I have found myself carting a toilet brush from one bathroom to another on cleaning day along with my other cleaning products. I decided it was time to put a toilet brush in every bathroom that was easy to grab when needed. I went to my local home store and purchased three chrome toilet brush holders. I could have just placed them in my bathrooms “as is” and went about my business but of course I just couldn’t stop there. 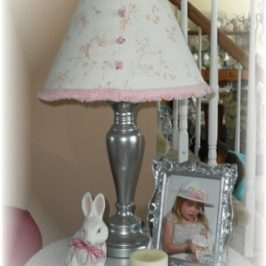 Plain chrome just does not fit into a vintage, shabby chic inspired room. 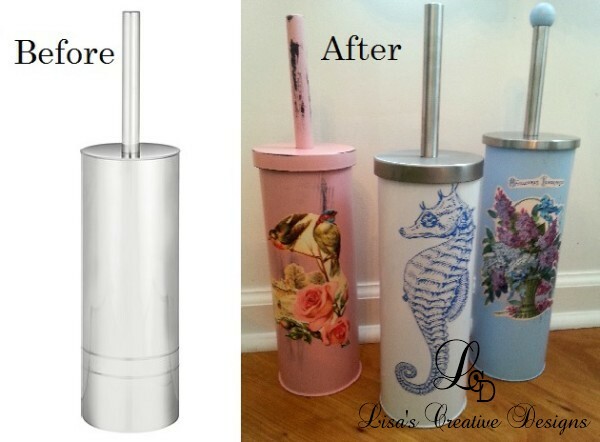 I decided to do a few “Toilet Brush Holder Makeovers!” Ok, so, have I lost my mind? My husband came in and asked what I was doing while I was working on them and he just smiled and shook his head. 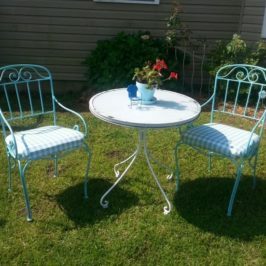 I began my makeovers by painting the first one a sweet periwinkle blue, gave it a light distressing and added a pretty vintage Lilac image to the front. 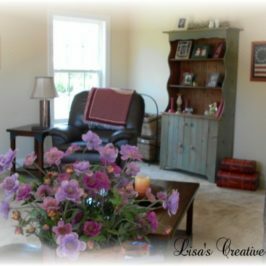 Lilacs are my absolute favorite spring time flower. It now sits in my garden inspired guest bathroom looking pretty. 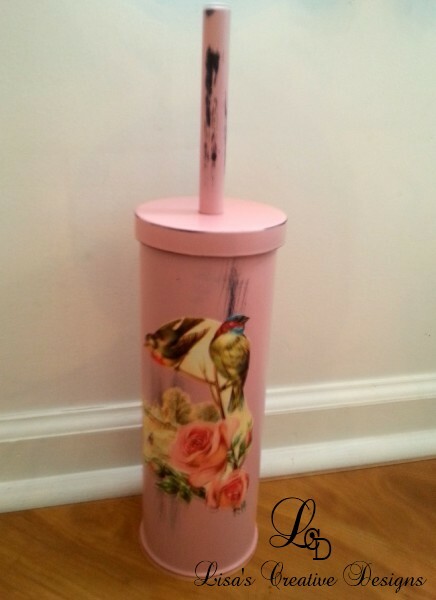 Toilet Brush Holder #2 received a few coats of petal pink spray paint, distressing and a vintage rose and bird image applied to the front. This pretty little thing now lives in my Master Bathroom right next to my revamped trash can. 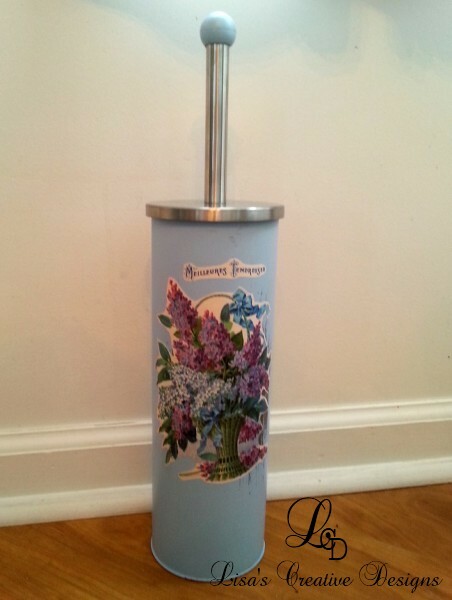 Toilet Brush Holder Makeover #3 was a little bit different. The base actually came white already so I didn’t have to paint it. 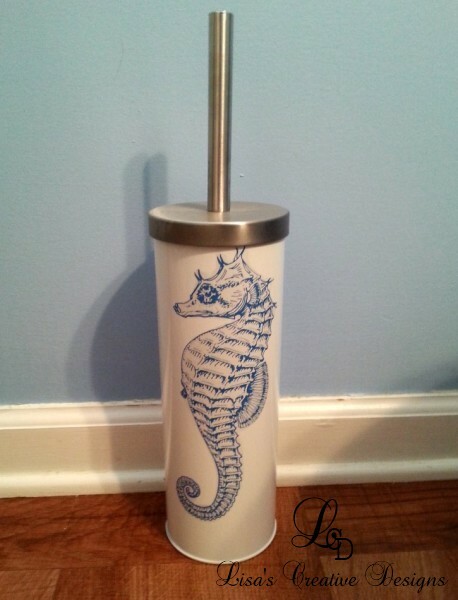 Instead I applied a customized vintage seahorse image using waterslide decal paper. Oh I love that stuff! 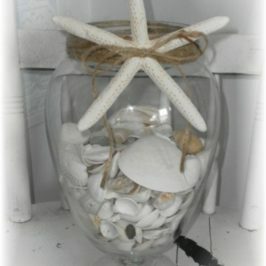 This baby can be found tucked away in my beach inspired bathroom. I have been tweaking this particular bathroom lately and will share some new photos soon. 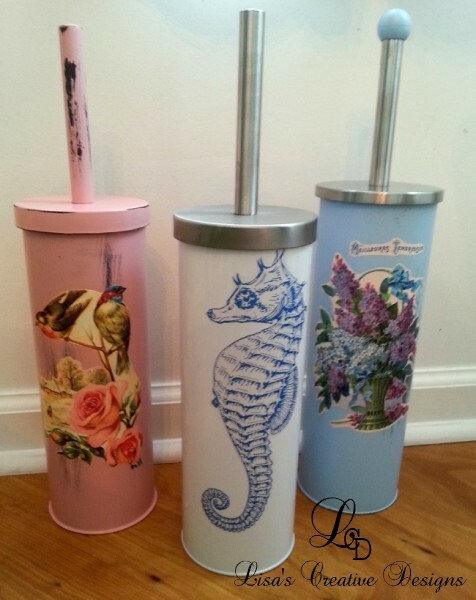 Here’s a photo of all three completed Toilet Brush Holder Makeovers. What do you think? Have I lost my mind? While some may think I have gone over the edge by revamping a couple of toilet brush holders but I had a lot of fun with these makeovers. 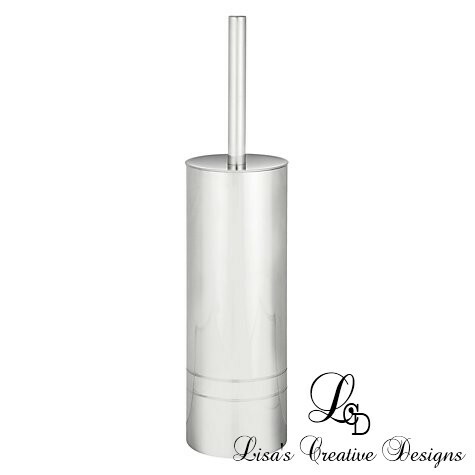 A generic, boring toilet brush holder can be a pretty accent for your bathroom with a few coats of paint and a pretty image. They can be easily customized to fit your own design scheme! Ooooh my gosh I love you!!!!! I have been on the search for months for a pink bathroom trash can and toilet bowl brush holder and have not found what I need. 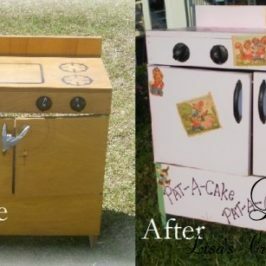 I had the same idea you blog about of spray painting chrome ones would work and look good but you have definitely shown me it does! Now, any ideas on toilet paper holders?!? 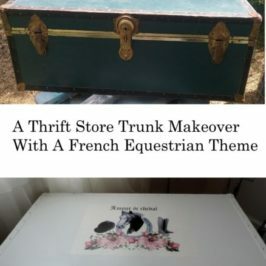 Lol thank you for blogging this!